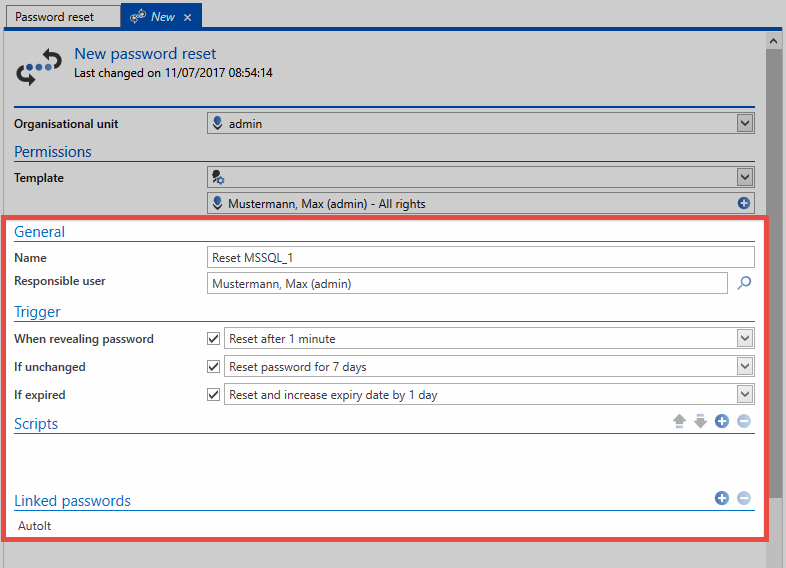 New Password Resets can be directly added via the ribbon or the keyboard shortcut “Ctrl + N” in the Password Reset module. With regards to setting permissions, a Password Reset behaves in precisely the same way as every other object. It is thus possible to precisely control which users can view and use which Password Resets. The configuration of a new Password Reset comprises four steps. All of the necessary conditions and variables for the configuration are defined in the following areas: “General”, “Trigger”, “Scripts” and “Linked passwords”. 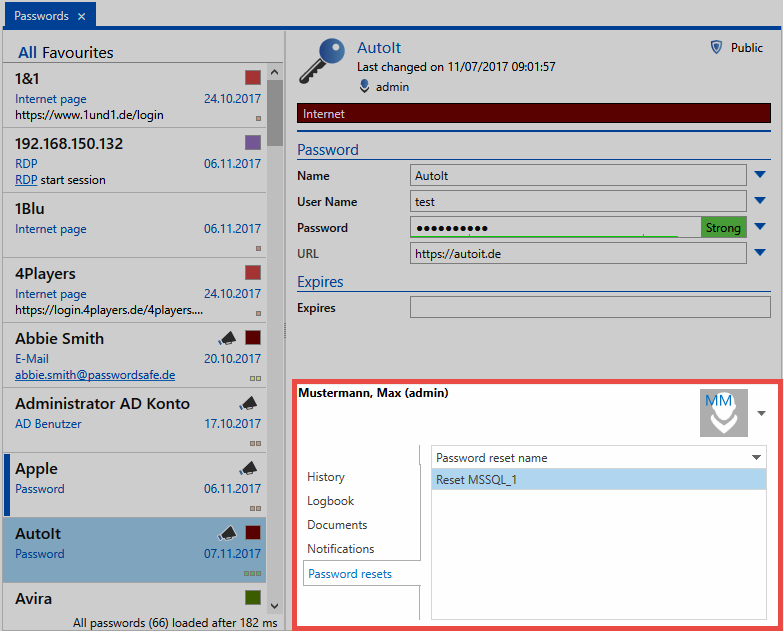 Responsible user: All completed Password Resets are also recorded within Password Safe (logbook,…). To ensure these steps can be allocated to a user, a user who is registered in Password Safe is selected in the field “Responsible user”. At least one trigger must be activated so that the Password Reset is activated. Deactivating all triggers is equivalent to deactivating the Password Reset. All three triggers can be activated and deactivated independently of one another. Only one selection can be made in each of the three categories. *A separate system task within Password Safe checks every minute whether a trigger applies. A new dialogue appears after the selection in which the type of system “to be reset” can be defined. 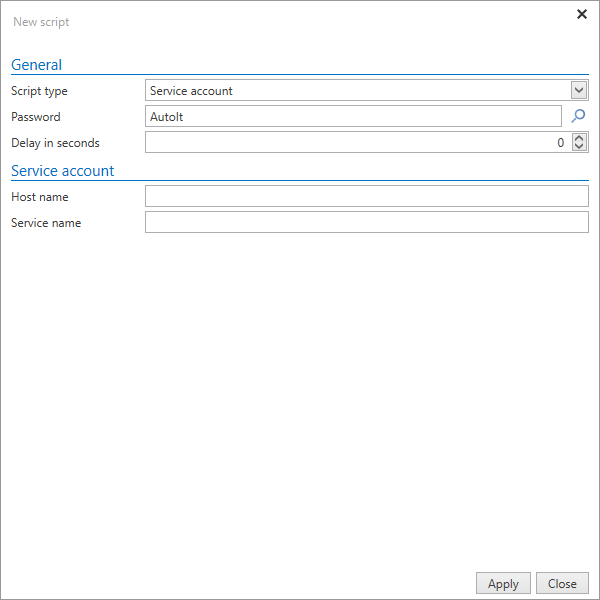 Script type: You select here from the possible script types. Password: The credentials for the record that will ultimately carry out the Password Reset. The required information is specifically requested in each case. For example, if the reset is for an MSSQL user, the MSSQL instance and the port used needs to be entered. The functions and configuration process are described in detail in the section Scripts. *It is not possible to create a Password Reset without an associated script. All records that should be reset with the Password Reset according to the selected trigger are listed under “Linked passwords”. Multiple objects can be entered. The linked Password Reset is also visible in the footer of the reading pane once it has been successfully configured.